Today was an exercise in budgeting. Some good choices, some not so good choices, some lessons learned. I started the day with a great breakfast. 1/2 cup of cottage cheese, with pineapple and a tbsp of granola spinkled on top. I had decided not to bring a lunch today - I just didn't feel like making one. So I ended up going to a Mexican fast food chain with some of my colleagues. I still made fairly good choices and ordered a small, whole wheat, chicken breast burrito. I asked for less rice, beans, and cheese than normal and extra veggies. But I did get guac and chipotle sauce. 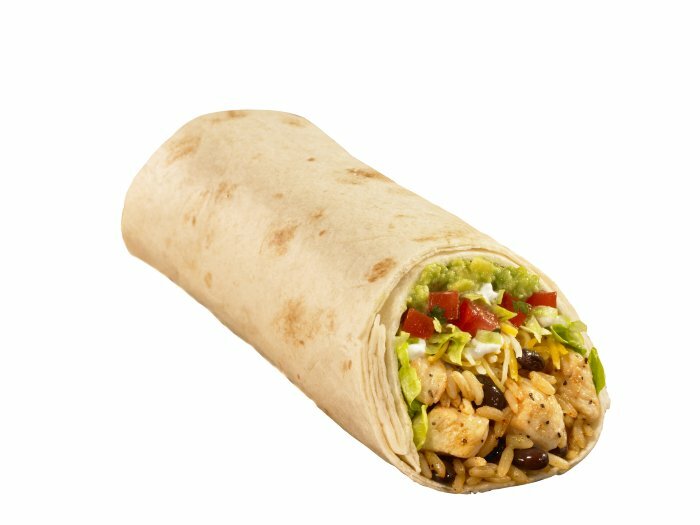 Based on the (surprisingly detailed) nutritional info from their website (which I looked at after the fact) I'm guesstimating my burrito was about 680 calories. Not bad for a fast food burrito, but way more than I would normal "spend" on lunch. This is not my picture but it looks pretty close! After tracking this and the rest of my snacks throughout the day I figured out how many points I had left for dinner. Not many. So I made the most of it and made one of my favourite low-point dinners. Marinara sauce over steamed zucchini "noodles" and mushrooms! I realized a while ago that what I really like about pasta is the sauce! And I find steamed zucchini (and whatever veggies I want to add) works as a great carrier. Using my peeler I peeled a zucchini into thin strips. Then I added chopped mushrooms (gives it kind of a "meaty" texture). Then I steamed the veggies in the microwave, topped them with marinara sauce, mixed it all together, and sprinkled it with a bit of parmesan cheese. Basically, it is just a big bowl of veggies. A DELICIOUS big bowl of veggies!! So in the end, I salvaged my day and came in right at my daily points target. But I was reminded (again!) that making my own lunches is important. Although I thought I really wanted a burrito it really wasn't worth it. It wasn't THAT tasty or filling and actually made me want to snack more than normal in the afternoon. However, I'm not getting too hung up about it - one less than stellar choice is really not the end of the world. It's just a reminder to make good choices and manage my budget wisely! This cartoon made me laugh today (thanks Evan!) and reminded me I should pick up my knitting needles again! Good for you on "rescuing" the day! It's days like this that just teach you one more thing about this journey, and how you can have success. And that cartoon - love it! I never used zucchini to make a "pasta" dinner before. That sounds like fun and I will try it next week.